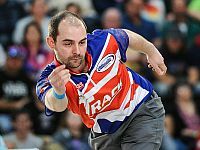 EJ Tackett of Huntington, Ind., had four chances to throw doubles to take the lead, but in the end, he won his second Professional Bowlers Association major title in the 52nd FireLake PBA Tournament of Champions Sunday at FireLake Arena in Shawnee, Okla., thanks to an unexpected error by his opponent. 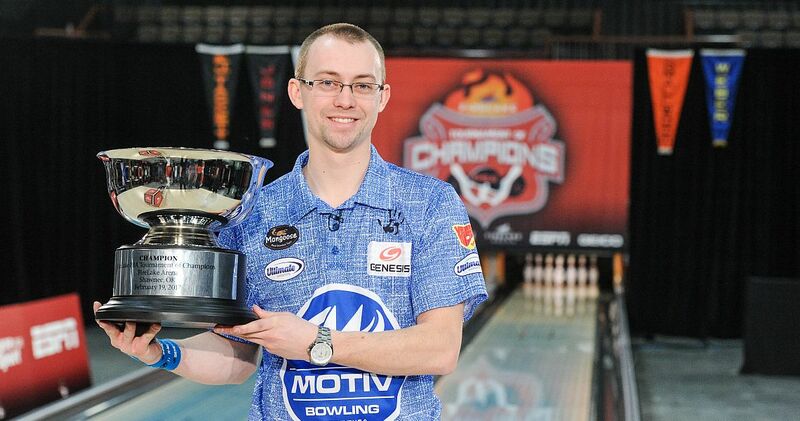 Tackett (right, and above with the trophy), at age 24, defeated 18-time PBA Tour champion Tommy Jones (left) of Simpsonville, S.C., 208-203, when Jones left and failed to convert the 1-2-4-10 “washout” in the 10th frame. In the opening match, Tom Smallwood (right) of Saginaw, Mich., ended Pete Weber‘s (left) bid for a PBA-record 11th major championship, 223-203. 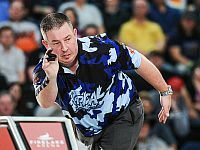 Tied at 163 after eight frames, Smallwood finished the match first, throwing four strikes and forcing Weber to do the same to tie and force a roll-off. 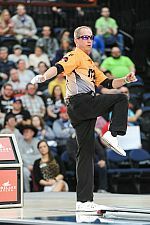 But the 54-year-old Weber, from St. Ann, Mo., left the 1-2-4-10 on his opening shot of the 10th frame to end the match. England’s Dom Barrett (right) then eliminated Smallwood, 235-202, striking on seven of his first eight shots to build an insurmountable lead after Smallwood left splits he couldn’t covert in the first and fourth frames. 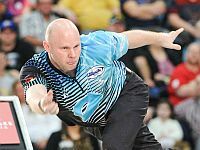 PBA players begin competition in the United States Bowling Congress Masters, PBA’s third consecutive major championship in February, on Tuesday at The Orleans Bowling Center in Las Vegas. The Masters qualifying rounds will be held Tuesday, Wednesday and Thursday to determine the 63 players who will join defending champion Anthony Simonsen of Austin, Texas, in the three-game, double-elimination match play rounds Friday and Saturday. 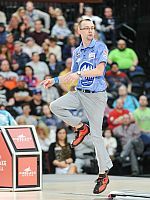 The stepladder finals will air live on ESPN on Sunday, Feb. 26, at 1 p.m. ET. All qualifying and match play rounds of the Masters will be live streamed on PBA’s Xtra Frame online bowling channel. For subscription information, click here. Sunday’s finals also will be live streamed on ESPN3 and the WatchESPN app. 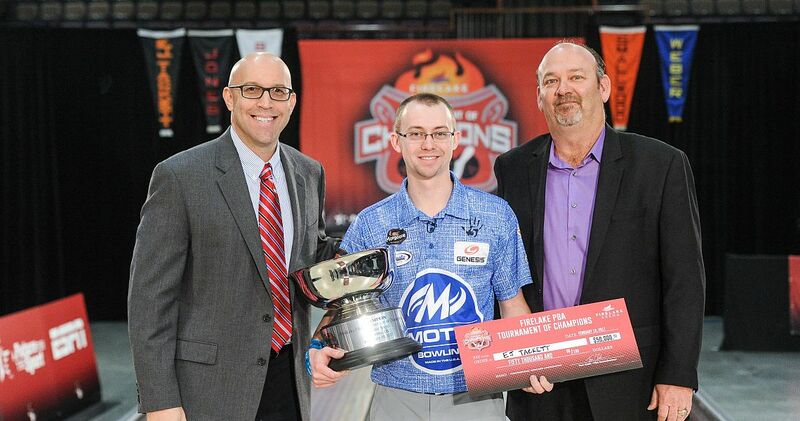 EJ Tackett, center, with PBA CEO & Commissioner Tom Clark, left, and FireLake Director of Bowling Chris Skillings, right. Championship: No. 1 Tackett def. Jones, 208-203.